Franklin County's fifth World's Record will travel Vermont this summer. 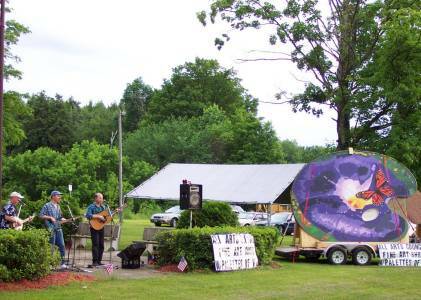 Vermont Art Council Day was celebrated Sunday, June 25, at the Green Mountain Chew Chew from 11 a.m.-5 p.m. 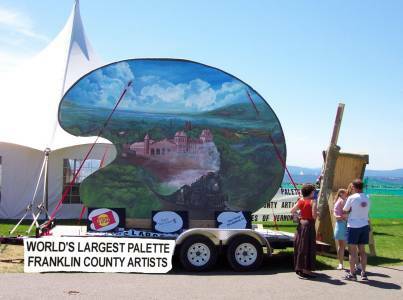 The World's Largest Palette, created by the All Arts Council, St. Albans for the Future, and professional and community artists from Franklin County, was on display outside the VAC tent. "Having the World's Largest Palette here was wonderful," VAC's Diane Scolaro said. "It drew people in to the Palettes of Vermont exhibit." In addition to the display of unique palettes from around the state, the Chew Chew featured live music and palette making activities. The World's Largest Palette made a surprise appearance at the Summer Sounds concert on Sunday evening, backing up the Stockwell Brothers with some folk art of its own.